One cultural aspect that defined the Viking Age was a predilection for traveling. Whether their wanderlust stemmed from the tradition of raiding for prosperity, acquiring or trading resources, searching out places to settle, or simply to explore freely, each expedition required a basic amount of planning and preparation. Long journeys were mostly taken during the summer months, when the fjords were free of ice and the sea less treacherous. The winter before would be spent building ships, weaving sailcloth, and preparing food such as cheeses and skyr (type of yogurt that is still popular today.) I imagine some time was spent training for possible conflict. In just a few days, I’ll be leaving for my next voyage to continue photographing and making videos. Here I will share some of the process that goes into planning a 6-week shooting expedition throughout the North Atlantic. Research and itinerary: In my quest to photograph along the westward routes of Norse explorers, Greenland is the most challenging place to visit and my main priority for this year. Over a year ago, I began contacting archeologists that may be working in Greenland this summer and found Georg Nyegaard from the Greenland National Museum in Nuuk. He was pleased to have me join him and his team in South Greenland for a couple of weeks while they work on the restoration of a few Norse sites. Flying into Greenland is most commonly done via Reykjavik or Copenhagen, so I decided to go back to Iceland, where I could re-shoot some of the sites I’ve missed due to inclement weather. Afterward I will travel throughout South Norway to photograph the Børre mound cemetery and the Viking Age village of Kaupang. Finally, no trip to Scandinavia is complete for me without stopping in Gotland, where I’ll visit some friends at the Brucebo residency. My itinerary in South Greenland includes Qassiarsuk (Brattahlid), Igaliku (Norse Gardar) and Hvalsey (Hvalsey Fjord Church). Assembling a crew: Viking Age seafarers would often travel in groups with multiple ships. My travel experiences have been mostly solitary however this upcoming expedition will entail making a film, something rather new to me. For the Iceland and Greenland part of the trip, I will be accompanied by my partner The Virtual Hiker, as well as filmmaker Terryll Loffler. Preparing for remoteness: Some of the places where we will be shooting in Greenland are in the backcountry, where ruins have been well preserved as villages have not been built over or around them. Part of the expedition entails camping in the wild, with no electricity to charge camera batteries, and nowhere to buy or refrigerate food. After considering solar chargers, which are heavy and expensive, our solution to the lack of power is to stock up on Canon 5D Mark II batteries (we have a dozen)! In terms of dry foods, I’ve spent the last week cooking and dehydrating chili and curry dishes for us to eat in Greenland. Bringing the right gear: I wish I had a Viking ship to carry all the gear we need to bring. 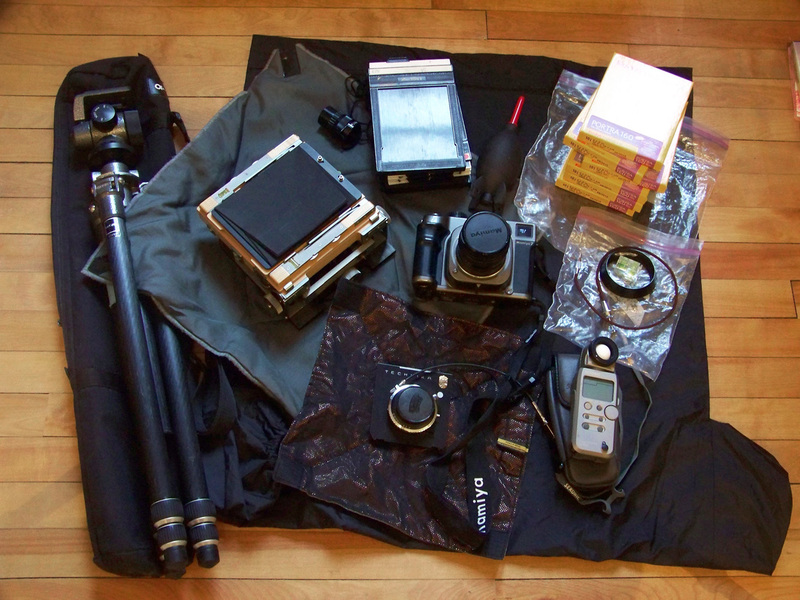 Aside from the camping gear and warm clothing, we have abundance of photo and video equipment: 2 tripods, 3 tripod heads, a dolly track, a 4”x5” view camera with holders and other accessories, a light meter, a medium format film camera, 2 Canon DSLR cameras, sound recorders and microphones, along with laptops and external hard drives. Too bad there isn’t a Norse god for technology. Getting in shape: In order to be able to carry all this gear and walk long distances, I keep in shape with a combination of running and Yoga. I also practice orienteering with the Ramblers club in Montreal, yet I still managed to get lost at Fjäle in Gotland in 2011. Finally, there is only so much one can do to prepare for travel. Sometimes being over prepared takes all the adventure out of the journey. Another important aspect of Viking Age culture was their belief in Luck (yes, with a capital L.) Some people were more Lucky than others, and some journeys as well. I hope for a good dose of Luck on this one.